One of the most challenging, yet enjoyable aspects of creating bespoke kitchens is choosing the right colour scheme. The colours need to be in keeping with the overall style of the space as well as bright and cheerful. Choosing the paint colours for the walls and the materials essentially boils down to a process of elimination. Once the unsuitable colours have been filtered out, you will be left with a simple and easy to choose from palette. 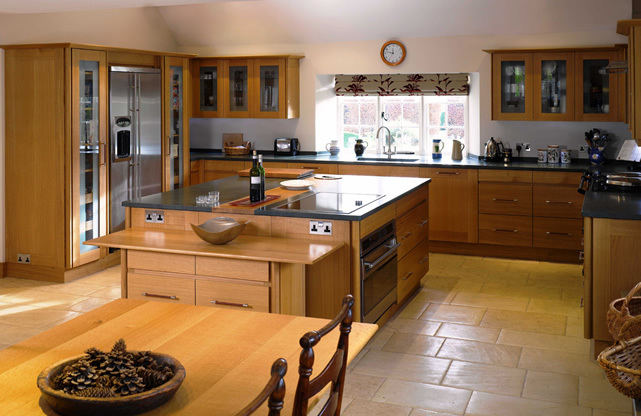 One of the primary considerations when choosing a colour scheme for bespoke kitchens is the size of the space. For instance, small kitchens should not include dark coloured woods in the cabinetry and dining furniture, as these will only serve to make the room appear smaller. On a similar note, when it comes to the wall colours, it is often best to avoid darker shades of greens, blues, purples and reds. Instead, look for colours that brighten the space; white or yellow are excellent choices, as they give a small kitchen a spacious, ‘open’ appearance. If you still want some other colours in the room, then there is always the option of adding bright coloured kitchen appliances to the countertops, or a colourful curtain to the window. Those with larger bespoke kitchens have more options when it comes to selecting colours for the room. They can afford to play around with bold colour combinations, as the wide open space will ensure that a striking colour scheme will not overwhelm the style of the space, as can easily occur in smaller kitchens. Whilst in this sense, larger kitchens offer more options in terms of the decor, it is still important to stick to a few key guidelines when choosing colours for the furniture and the walls. The decorative theme of the kitchen should still be in keeping with the decor in the rest of the home, as a brightly coloured kitchen in an otherwise neutrally decorated house can create a disjointed and jarring effect. It is usually best to choose colour tones that are within the same palette as the rest of the house. In larger kitchens, white walls can look just as crisp, clean and chic as in a smaller space; however, there is always the risk of the room appearing cold and uninviting if white is chosen as the main colour. To counteract this effect, it is best to add some dashes of colour and texture. Take advantage of the open space of a large kitchen and add a red dining set or some other bold coloured accents. The amount of natural light available in the kitchen is another important factor when making colour choices for the room. If there are big windows, then those with a standard sized kitchen can afford to use a slightly darker colour palette. If using darker tones, remember to add some feature lighting, so that the space will still appear spacious in the evenings, when the light from the window is gone.